It is reckoned that in the UK, housing is responsible for about 25% of greenhouse gas emissions. Poor heating can render parts of dwellings virtually unusable, partly through discomfort due to cold and drafts and partly through the damage caused to contents through condensation, dampness, mould growth, etc. effectively reducing the house size because you can’t use parts of it. Couple this with rising energy costs and the danger of CO2Carbon dioxide is a gas which is given off when carbon based materials such as fossil fuels (coal, oil, and natural gas) are burned. It is called a greenhouse gas because it works like the glazing of a greenhouse and causes global warming pollution and there is every reason to put a lot of thought into the design of the heating system. Although zero carbonbit of a slippery fish. It tends to mean that a building uses no carbon (oil, coal, etc) to heat it (meaning in a 'net' way). It usually ignores the carbon which goes into building it (the embodied energy). See the page on Zero Carbon? houses are possible (and set to be mandatory by the EU for new build by 2021 – see the EPBDEnergy Performance of Buildings Directive. This is the EU directive that all new buildings shall be "Nearly Zero-Energy Buildings’ from 2021. ), probably the best practical examples of low energy building are PassivhausSee more on the Passivhaus standard. The PassivHaus Institute has pioneered a standard for low energy buildings. It includes very low energy usage and ways of achieving this. The word is derived from the idea of buildings which are fundamentally low energy and passive solar heated rather than using extra gadgets to heat them. See Passivhaus for the UK branch of the organisation.. The beauty with Passivhaus is that the heating load is so small that no conventional heating system such as central heating is required. Almost all the heat is derived from the activities of the occupants and from sunlight, with only a very small fraction of heat needing to be introduced into the incoming ventilation air. Unless you have a large source of free non-polluting heat such as geothermal then the best type of heating is the least. This means large amounts of insulation and airtightness and also good heating controls. is combined heat and power (CHP Combined heat and power - where the heat which is produced when electricity is generated is used within a heating system rather than wasted. This can happen at different levels - within a single house, a housing development, a town etc. ) an option? The maintenance aspect of heating can be considerable with costs currently running around £200 p.a. for a gas boiler if you have insurance and do scheduled maintenance. The Building RegulationsThese are the mass of regulations that cover safety, health, welfare, convenience, energy efficiency etc. in the way buildings are constructed. Not to be confused with Planning consent (which is more to do with whether you can put up the building in the first place). See more on the regulations (Approved Document part JThe Approved documentsApproved documents (England) are detailed publications which come under the English Building Regulations. They are based on tried and tested methods of building and if you follow them you are assured of complying with the Regs. The equivalents for Scotland are the Technical Handbook, for Wales: the Approved documents (Wales), and for N.I. the Technical Booklets, (England) part J, deals with Combustion appliances and fuel storage systems) stipulate what type of hearth is required for various stoves and heaters and other issues such as combustibility of the surrounding areas. Chimneys are also covered by the regs and it should be noted that if a stainless steel twin wall fluepipe to conduct gas, typically ventilation air or boiler exhaust. see Flue is used then (depending on the manufacturer) the specification will vary between different types of fuel such as gas, coal and wood. 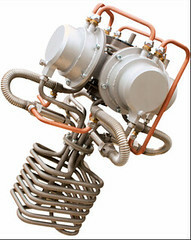 Fluespipe to conduct gas, typically ventilation air or boiler exhaust. see more on Flues serving wood stoves have a tendency for tar to build up on the inside and then catch fire. This is more likely if the inside surface becomes cool due to the length of the flue or lack of insulation round the flue or burning damp wood. This is why a special type of flue is required for wood burning. It needs to be able to withstand quite a fierce fire which would never happen in a flue serving a gas fire. Many stove suppliers and installers will give advice on this. Very often you are forced to use a concrete hearth built into a floor and if the underside of this area is facing down into an unheated area such as a cellar then it is very important to insulate it heavily. Uninsulated, it will be a major heat loss downwards but if it is well insulated it can act as a heat store for any radiant or conducted heat coming off the appliance. All combustion appliances require an air supply and wood burning stoves are no exception. As houses become more airtight, the correct design of air supply becomes more of an issue. Many stoves are now designed so that a combustion air supply pipe goes directly to the stove rather than the stove getting its air from the room. This also cuts down on cold drafts within the room. Recent developments with balanced flueA combined flue, usually serving a gas heater or boiler, which handles both incoming combustion air and outgoing waste gas. wood pellet stoves mean you can locate the boiler on an external wall without a conventional flue or chimney just like a balanced flue gas boiler. See the Swedish Ariterm Arrow system. ventilation and air supply for appliances (this has a large bearing on ventilation and air tightnessA measure of how leaky a building is to air. In other words, how draughty it might be. There are now standard fan pressure tests to check how air tight a house is and the Building Regulations have minimum standards for all new houses (L1A – Conservation of fuel and power in new dwellings (England)). 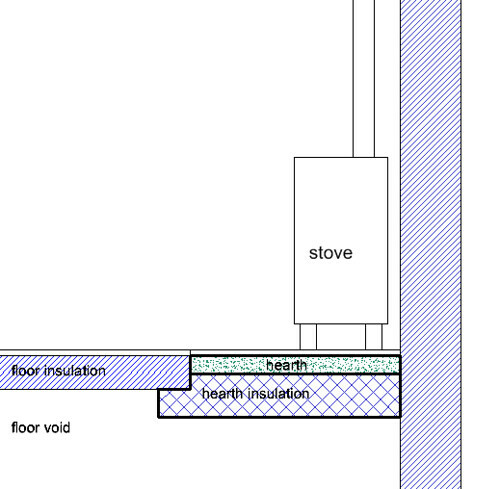 A much higher degree of air tightness is covered by the Passivhaus standard generally). ventilation and air supply for appliances (this has a large bearing on ventilation and air tightness generally).